I'm a beginner in the graphic novel arena, and was always slightly ashamed of being so. 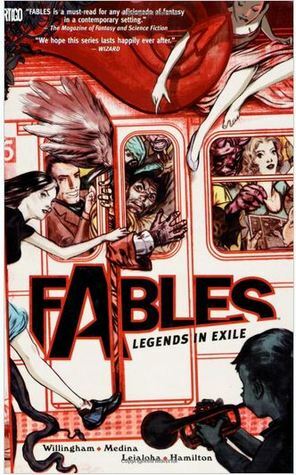 Fables was given to me by someone who thought (based on my literary loves) I would enjoy it; and I really did. As it was my first foray into the illustrated world, I have nothing to compare it to, nor can I pretend to be well-versed in what a graphic novel is supposed to look or feel like. I have never appreciated illustrations in novels, preferring to concentrate on nuances in the literature. I was blown away, however, by the severe detail involved in every panel, not to mention the way the story carried itself through these brightly coloured pages. Fairy tale folks interest me greatly, and the premise of this story is very attractive to me. The very idea of these people of ancient folklore living, breathing and strolling around New York is just absolutely delicious. I realise this is a series, and more will develop as I delve into the rest of them, but Legends in Exile turned into a bit of a stale murder mystery. The characters are brilliant as we already know a little of them from hearing widely repeated fairy tales throughout our lives. Willingham gives them all more of an edge, however, almost humanising them, and showing us their issues and flaws, rather than focusing on their beauty or riches as the age-old fables do. I like to learn about life subsequent to the 'happily ever after's, and it seems to be filled with divorce, financial scams, and misery. Who would've thought their lives would be filled with such hardship after their incredibly happy endings only centuries before? The second book in the series is now waiting for me. I'm hoping the plot will progress into something more satisfying than this. I would definitely recommend graphic novel beginners to pick this up; it's fact paced and quite exciting, and pages seeped in colour makes a nice change to black print on white.